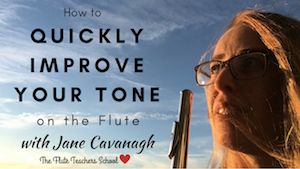 Do you know how to ALIGN A FLUTE properly? There's the simple way (line the embouchure hole up with the keys), and the more complex way (which takes other factors into account). This "more complex way" isn't actually complex - it's just a lot more interesting! It factors in your face shape, your natural (habitual) way of already playing, your hand shape, and the weight distribution of the keys on the flute. PS. Totally make a comment under the video after you've seen it. I'd be interested to hear what you think!